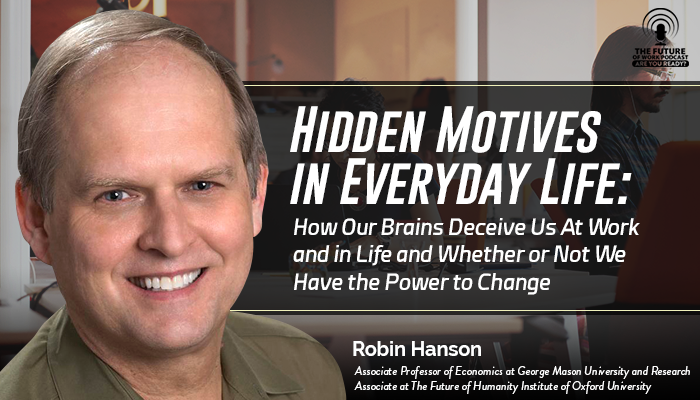 Robin Hanson is an associate professor of economics at George Mason University and a research associate at the Future of Humanity Institute of Oxford University. He has a PhD in social science from Caltech, Master’s in physics and philosophy from the University of Chicago and worked for nine years in artificial intelligence as a research programmer at Lockheed and NASA. He helped pioneer the field of prediction markets, and published The Age of Em: Work, Love and Life when Robots Rule the Earth, which was the topic of our discussion in a previous podcast episode back in 2016. His most recent book is entitled, The Elephant in the Brain: Hidden Motives in Everyday Life. He also blogs at OvercomingBias.com. The big mistake we are making – the ‘elephant in the brain’. the elephant in the room, n. An important issue that people are re¬luc¬tant to ack-now¬ledge or add¬ress; a social taboo. the elephant in the brain, n. An important but un¬ack¬now¬ledged fea¬ture of how our minds work; an introspective taboo. The puzzle of social status in the workplace is one to be explored. People are always working to improve their position within an organization but often the competition is ‘hidden’ by socially expected terms like ‘experience’ or ‘seniority’. To discuss one’s social status in the workplace is not acceptable. So, to continue to explore and think about people’s true motives can be beneficial. •	Why people have hidden motives. •	Are people just selfish? •	Why do companies have sexual harassment workshops? •	What could be alternative reasons to hold workplace meetings? •	Do we have the power to change our self-deceptive ways? Want To Hear More From Robin Hanson?